Hello! I have a problem that my script automatically sets my channel in +r mode when i start up my mIRC. It does this everytime and its quite annyoing for my nonregistered users . Can anyone tell my how i turn this mode off?? I DONT want it! Are you sure it is your nick which does this and not chanserv? You need to change chanserv settings for the channel. But yes, it's possible to do what you want. Add -r in the large custom fields. 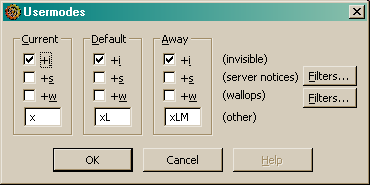 If it's your PnP which performs the mode change, just remove r from the custom fields in the Usermode popup.